Youth CAN has been entering over a dozen grants and contests throughout the year. Some have required writing, others a cool video. Now one of the popular ways that contest sponsors determine the winner is having a public vote. While this is a nice idea, it takes a lot of hard work to make sure your group gets enough votes – it's a whole project in itself. So when we found out that we were one of the five finalists in the youth category for Green Works' Green Heroes competition on Facebook, we went into full outreach mode. Our effort was two-pronged: use technology and be creative. For technology, we sent out Facebook and e-mail blasts, and even made a Facebook event dedicated to giving everyone the necessary information on how to vote. In being creative, we wanted to do something that would be just crazy enough so that we could really attract people's attention and commitment to vote (and keep voting, because for this contest you could vote every day). That's when we got four neon full body suits, three green and one purple (one of our school colors). 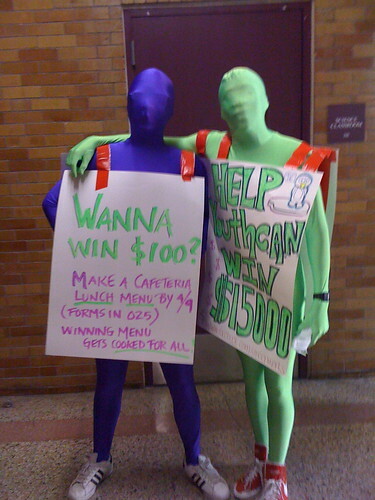 For several days, Youth CAN members dressed up in these suits and paraded through the cafeteria and hallways with signs about how to vote. They certainly did catch people's eye, and the kids who wore them had a lot of fun. And now, we are proud to say that we won this competition – the prize is $15,000. Our advice is to keep your eyes and ears out for grants and contests like this, and secondly, to always be original and a tad crazy, because that's how the best initiatives come to fruition.